A Department of Energy Computational Science Graduate Fellowship (DOE CSGF) alumnus is part of a team that has modeled a key mechanism in antibiotic resistance in bacteria. 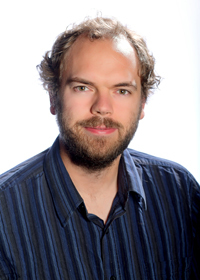 Joshua Vermaas, a fellow from 2011 to 2016, is lead author of a paper describing the research that was recently published in the Proceedings of the National Academy of Sciences. Vermaas, now a postdoctoral researcher at the National Renewable Energy Laboratory, worked on the antibiotic project while still a graduate student at the University of Illinois at Urbana-Champaign. The project, with doctoral advisor Emad Tajkhorshid and Susan Rempe of Sandia National Laboratories, used computers to model a biological pump called EmrE in the common bacterium Escherichia coli. In antibiotic-resistant microbes, such pumps eject unfamiliar small molecules, such as germ-killing chemicals, before they can damage the organism, a Sandia release says. If researchers can find ways to block these pumps, they may be able to overcome the bacterium’s drug resistance. Working with Rempe through Sandia’s Campus Executive Program, Vermaas used experimental data to build a detailed EmrE model and add a bacterial membrane. The researchers simulated the pump with differing numbers of protons, the subatomic particles that power it. The team burned through more than 80,000 hours of computer processing time to simulate the mechanism. The researchers also ran simulations to see what the pump looks like with an example drug in the drug-binding pocket. “Antibiotic resistance is an important problem,” Vermaas says in the release. The knowledge the group gained can help “figure out how to break the pump” and find new ways to kill harmful bacteria.